Also called as long melon, bottle gourd can be used as a vegetable when it is young or can be used as bottle, utensil or pipe when it is completely dried. It is a fast growing annual climber that requires adequate sunlight for flowering and fruiting. Introduction and Uses: Bottle Gourd also known as Lauki / Doodhi is one of the healthiest vegetables you can have in your vegetable garden. It contains about 92% of water and minerals that have the potential to keep your body hydrated. Not only this, the amazing veggie contains vitamins C, K and calcium. It also helps to maintain a healthy heart, bring down cholesterol, stabilise blood sugar and maintain blood pressure. Sunlight: Bottle Gourd plants require full sunlight. Therefore your raised bed should be made at a bright sunny spot. Keep the Bottle Gourd container under open sunlight. Watering technique: Water your potted Bottle Gourd plant every day in summer. Water the soil near the plant. Use a watering can to make sure that the plants get water in the form of the shower & not by a single flow. You can also make provision for watering by drip irrigation system for your raised beds. Trellis: Bottle Gourd is an aggressive climber & needs plenty of space to grow. So develop a strong trellis support up to height of 5-6 ft, by using locally available material like pipes, bamboo, ropes, wires etc. 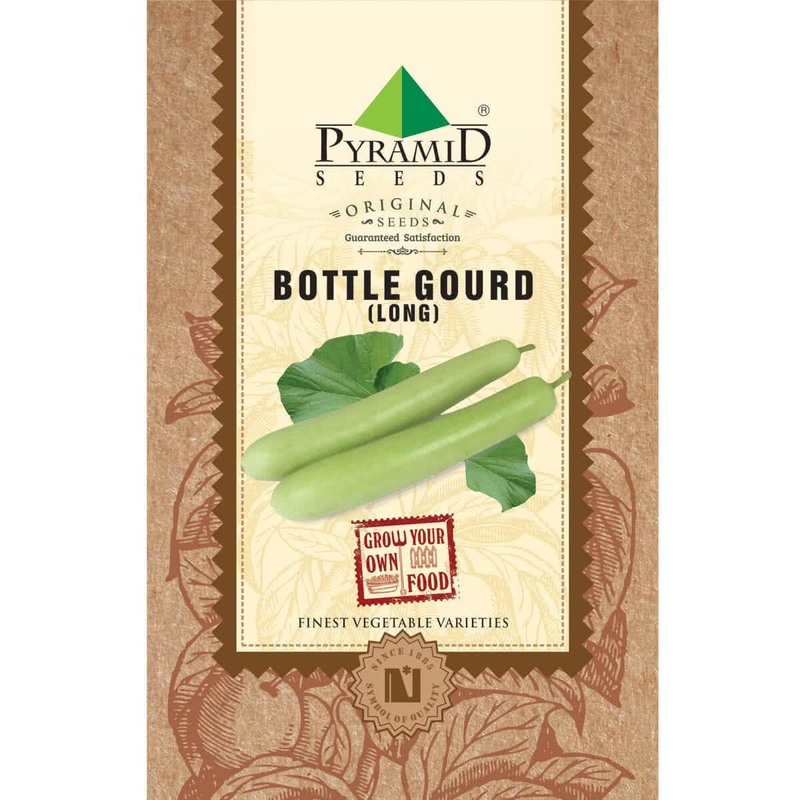 for your Bottle Gourd plant. Top dressing: When your Bottle Gourd climber is more than 45 days old, Provide one tablespoon of 15:15:15 (NPK) Fertilizer per plant or mix handful of Vermicompost in the soil around each plant. Buy fertilizers online. Note: Bottle Gourds have separate Male & female flowers on same plant. Fruits will be formed on female flower after pollination. Hand pollination of flowers: Take ‘pollens’ from male flowers on painting brush or cotton bud & dust them on ‘stigma’ of female flowers. This will increase overall production of Bitter Gourd. This step is not mandatory. Harvesting: ( 50-60 days) Bottle gourd climber will start flowering at the end of second month. You can start harvesting raw Bottle Gourd fruits after 2 months of seed sowing. Harvesting season can continue for next 3 months. Approx. 54 to 60 Seeds in 10 gm, 135 to 150 Seeds in 25 gm, 540 to 600 Seeds in 100 gm, 1350 to 1500 Seeds in 250 gm.